In the discussion below Zimmer and Peacock give some examples of we build models of the biosensors and medical diagnostics so that we can truly understand and predict their behaviour. In the images, adjacent Zimmer and Peacock have constructed a model of their electrodes and have linked how the depletion of the analyte near the electrode is reflected by teh drop in signal in a classic Cottrell response. A collaborator wanted a finite element analysis of their sensor so they could predict how changes would effect sensor performance. Therefore Zimmer and Peacock constructed a Finite Element Analysis Model (FEA) model of their electrochemical sensor. The FEA was carried out in a multi-physics programme. The analysis considered three chemical species, glucose, hydrogen peroxide and oxygen. All model parameters are presented in the table. 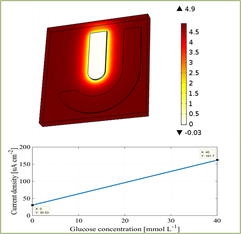 The model was confined to a cube space of 1000 × 1000×100 cubic µm, representing the active electrode area and its surrounding bulk solution, as illustrated in the adjacent Figure. This represented a µL volume dispensed on top of the active electrode area, or a larger sample in which the sensor was immersed, and where the mass transport provided by the bulk fluid motion was eliminated by the formation of a concentration gradient. In either case, a homogeneous analyte distribution in the solution was assumed. The layout and dimension of the WE and CE is the of the ZP micro-electrode - click here, for the ZP micro-electrode. 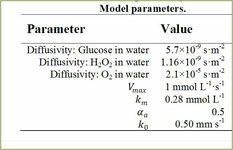 The finite element model reveals a very effective conversion of glucose and oxygen to hydrogen peroxide performed by the enzyme. In the adjacent concentration gradient can be seen spanning from the value of the bulk glucose concentration of 4.9 mmol L-1 to 0.0 mmol L-1 towards the WE. This indicates that the mass transport limiting layer is capable of slowing down glucose transport to the enzyme domain enough so that the produced hydrogen peroxide is electro-oxidized immediately after having diffused to the WE surface.